It’s the time of year to reflect on the things for which we’re thankful. Investors tend to focus their gratitude on the winners they pick, but research shows that it might be more profitable to focus on avoiding losers. 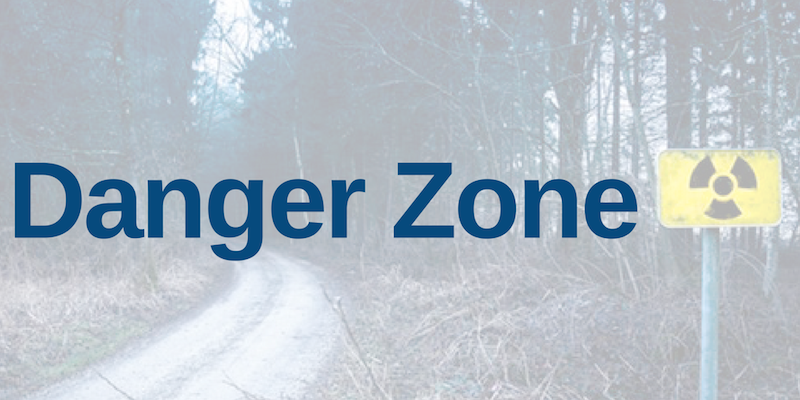 To that end, we’re summarizing some Danger Zone picks that steered readers away from stocks whose true colors have been revealed in the recent market volatility. Investors that failed to heed our warning the first time are in the Danger Zone this week. On August 6, we put the “Micro-Bubble” in the Danger Zone for the first time. We highlighted five stocks – Amazon (AMZN), Netflix (NFLX), salesforce (CRM), Tesla (TSLA), and Spotify (SPOT) – with negative free cash flow and unrealistically high expectations for market dominance that was embedded in their stock prices. Per Figure 1, shareholders in those companies have lost a combined $220 billion (18%) since we published that article while the S&P 500 is down just 8%. Tesla (TSLA) is the only company on the list whose market cap has not declined, but the stock is still down 8% due to dilution from employee stock compensation. AMZN reported record profits in 3Q18. NFLX spiked after beating expectations for subscriber growth, only to give up those gains in a week. The contrast between the positive news and the poor stock performance shows exactly why we labelled these stocks a “micro-bubble”. When the expectations are sky-high, even good results can disappoint. Amazingly, though, none of the stocks in Figure 1 hold the title for the worst performing micro-bubble stock. That honor goes to Snap, Inc. (SNAP), which is down 52% since our article on August 13. We launched our pre-IPO coverage this year. Given that 83% of IPO’s this year have been unprofitable, it’s no surprise that many of these IPO’s have ended up in the Danger Zone. Even though the stocks’ valuations have declined, the red flags just keep piling up. Amidst its slumping stock price, Domo’s president announced his departure for another cloud startup. Executive departures are just another red flag that make the stock especially risky in a market that is not quite as easy to navigate these days. It’s not just stocks that end up in the Danger Zone. ETFs and mutual funds can put investors at risk when they have poor holdings, misleading labels, and excessive costs. Two mutual funds found their way into the Danger Zone this year. In June, we warned investors to stay away from Lord Abbett Value Opportunities Fund (LVOAX). The fund promises value right in its name, but its holdings have negative free cash flow and a price to economic book value (PEBV) of 3.8, which is significantly more expensive than the S&P 500 at 2.7. Since our article, LVOAX is down 16% while the S&P 500 is down just 4%. A month later, we put HSBC Opportunity Fund (HSOAX) in the Danger Zone. This fund promises to deliver “consistent or accelerating earnings growth”, but its holdings have low and declining economic earnings. Since our article, HSOAX is down 14% while the S&P 500 is down just 5%. Both the funds above also have above average total annual costs, a trait they share with the AI Powered Equity ETF (AIEQ). AIEQ debuted with a great deal of hype last year by promising to pick stocks using artificial intelligence. It capitalized on this hype by charging an expense ratio of 0.75%, which is higher than 90% of the ETFs we cover. Despite the high fees and the promise of a unique stock-picking approach, our analysis found little differentiation between the holdings quality of AIEQ and the S&P 500. In addition, the ETF gives almost no information to investors about the technology behind the fund or the methodology it uses to pick stocks. The black-box investment methodology and above-average fees led us to recommend that investors avoid the fund. Since our article, AIEQ is down 4% while the S&P 500 is flat. The poor performance of AIEQ, along with all the other examples above, shows why investors need diligence. Buying stocks on the basis of an exciting story, the recommendation of conflicted sell-side research, or misleading accounting earnings can lead to portfolio blowups. The only way to protect yourself from this risk is to do the hard work of analyzing the cash flows of a business and understanding the cash flow expectations embedded in its stock price. Our Robo-Analyst technology makes institutional-quality diligence available to all investors. TD Ameritrade (AMTD) gives seven million of their clients the diligence needed to make informed decisions by putting our unconflicted and comprehensive research on stocks, ETFs and mutual funds at their fingertips. This article originally published on November 26, 2018.